A Girl Can Do It!!! 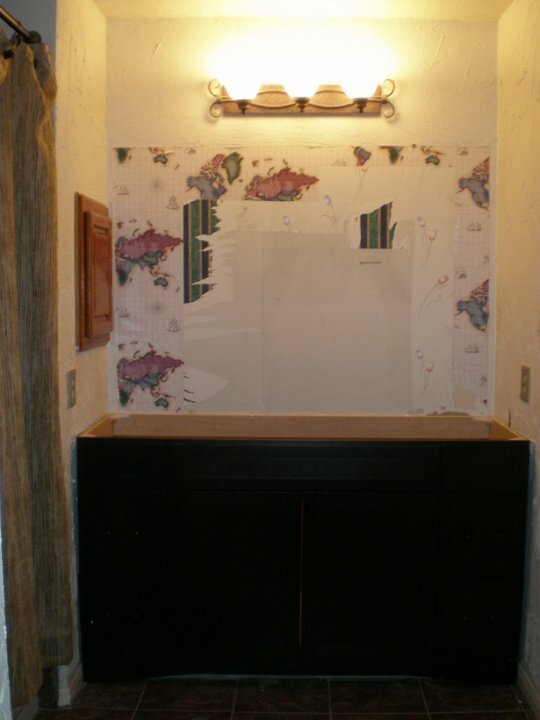 One project truly does lead to another when you are able to start small and gain confidence in yourself along the way. 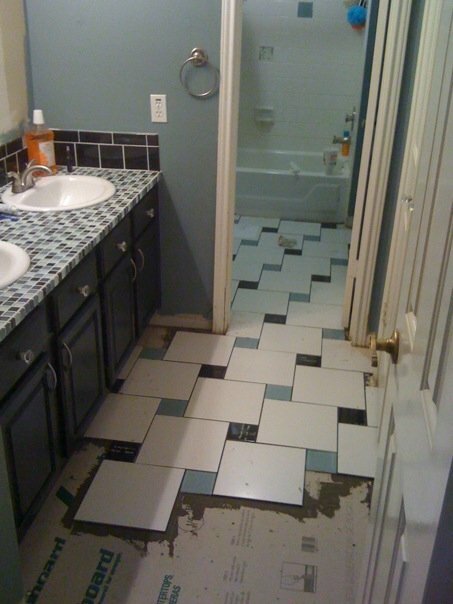 My friend and neighbor, Marian Takushi, recently completed one bathroom remodel when she decided to take on another. 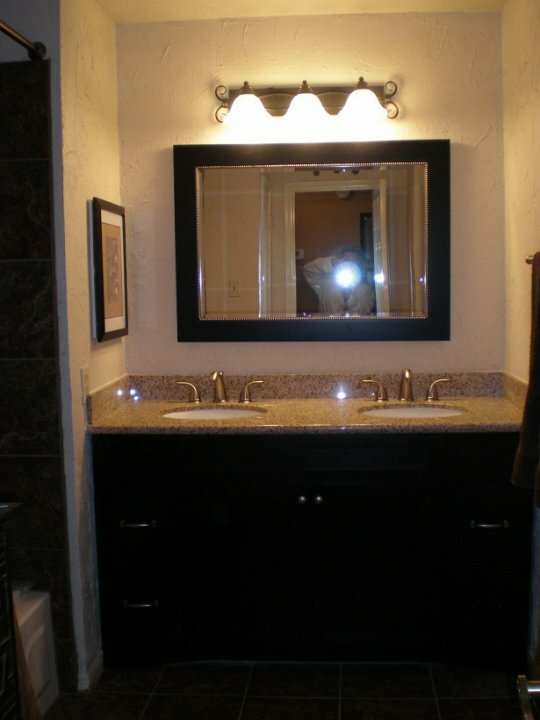 Existing counter top and cabinets were replaced with standard order black cabinets (available in a variety of finishes and sizes from Lowes and Home Depot and these are very reasonably priced from around $200-500); granite top was done at a steal from scrap pieces for around $350. Existing builders grade mirror was removed to reveal about 3 layers of wall paper. Ordinarily, this could have been a nightmare. 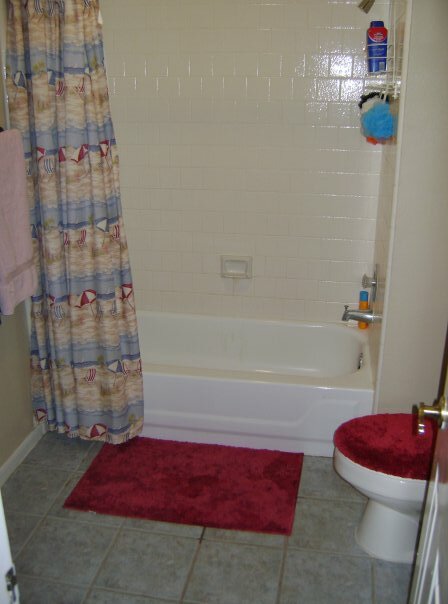 But instead of removal, Marian repeated the stucco finish on her wall by troweling stucco patch in the same stroke pattern as the rest of her bathroom and painted over it. New framed mirror is now in place. Smartly, she re-used the existing light fixtures but repainted with Krylon’s hammered metal finish paint to give them a new look. 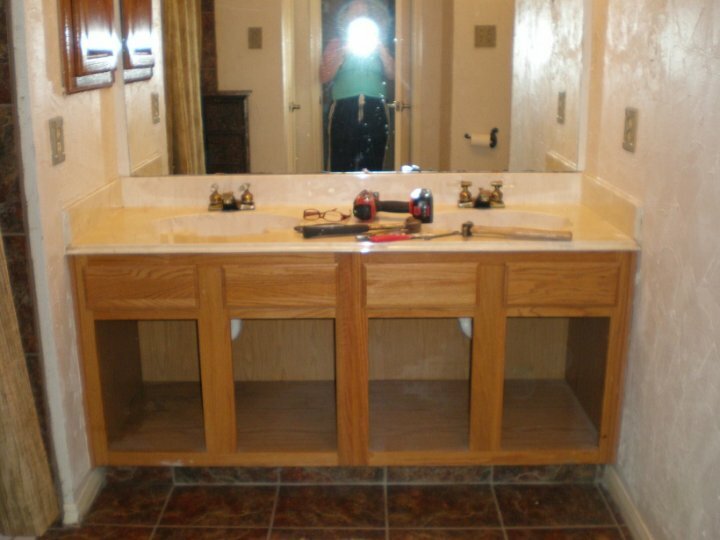 And this is a neat idea….instead of replacing her medicine cabinet which would have cost $200, she found a picture frame for around $20, placed hinges on it and mounted it to the existing recessed medicine cabinet box. Now she has a framed art medicine cabinet. Very cute and practical. 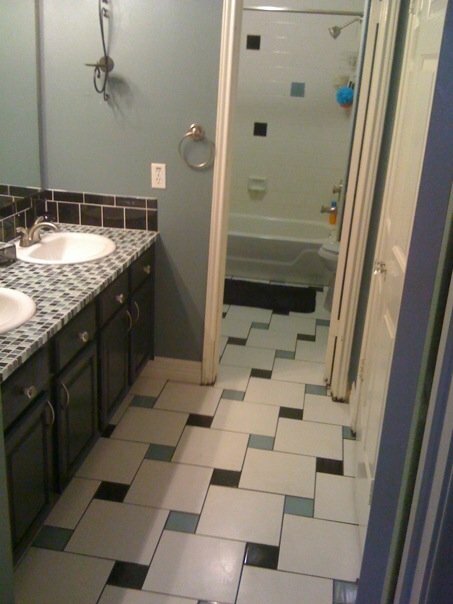 Now Marian has a chic and updated bath that took less than a week to finish! You can do it too! 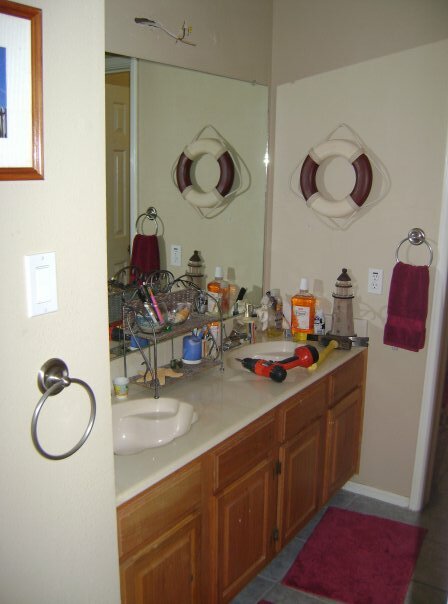 Some of the projects completed like tile and faucet replacement will take a little more know-how, but in time, will be talking about all of this on this site. If you’d like to complete a project like this and just don’t know how, comment back and I’ll try to help with the “how to” advice! Many of these topics will be covered on this site. You CAN do it! 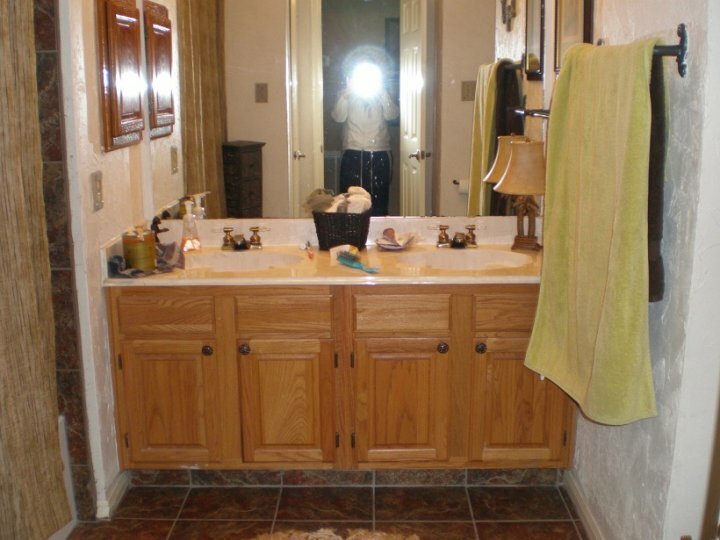 Surprisingly, cabinet hardware is an easily overlooked feature in your bathroom or kitchen that for a little effort and a few bucks, it adds a lot of personality and character to the room instantly (see my earlier story about http://agirlcandoit.com/2010/04/21/6-quick-and-easy-tips-for-a-budget-kitchen-makeover/). The sky is the limit when it comes to choices and prices in cabinet hardware. You can find a decent variety off the shelf at your local Home Depot or Lowe’s, but you can custom order something fancier or look online at some sources below. You should easily be able to find a stylish knob or pull off the shelf for $2-5 each. A good place to start would be the style you are trying to achieve first. Contemporary, traditional, Tuscan, retro? Are there design elements in the room already that you can highlight? 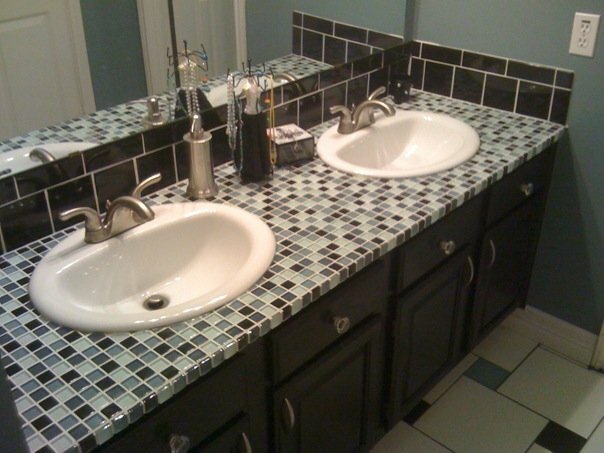 Something simple is always best if you are feeling indecisive about the style you want.